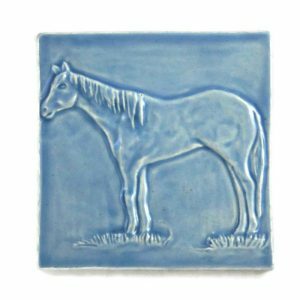 The Horse 4 Inch Ceramic tile is hand crafted from stoneware clay and high fired, rendering a tile that is both beautiful and durable. Each tile is made just for you, so please allow 4-6 weeks delivery. The Horse 4 Inch tile was crafted to celebrate America’s Horse, the Quarter Horse. We love these beautiful creatures for their wide range of ability from western riding and working with cattle to English Equestrian events. Show off your love for these amazing creatures by adding a few of these tiles to your next home remodel. Each tile begins as a slab of clay, hand carved and cast in plaster. Take a moment to read about our tile process. We have several glazes for you to choose from in our shop. A variety of colors to match any tile installation and décor. Fire Creek can help you achieve the look of your dreams. We craft every tile just for you, so please allow 4-6 weeks delivery. Do you still have questions? You can find answers to our frequently asked questions HERE. You can have tile that reflects your heart and live in a home that is truly you. Be Bold, Be Brave, Be You! Choose tile that reflects your personality!